If you're used to having a backpack full of gear, a single blade and a handful of arrows can make for a powerful experience. Atmosphere is a subtle beast. Formed from tiny details that combine into a pervasive whole, nudging the player's feelings in a specific direction. In Issue 276 of The Escapist, Brendan Main talks about how the contents of a hero's pockets go a long way to influencing how a player feels about a game, using the austere arsenal of Shadow of the Colossus as an example. So. A sword, a bow, and a horse. Only in a videogame could such a setup seem Spartan. In the usual order of things, this is the start of a breadcrumb trail from one item to the next, with new technologies arriving to meet new challenges, until you have more gizmos than you know what to do with ... At the end of [Legend of Zelda:] A Link to the Past, you're packing a thrice-upgraded sword, bombs, arrows, a mirror shield, a fire rod, an ice rod, a hookshot, magic boots, a magic hammer, a magic boomerang, a cape that makes you invisible, a medallion that makes earthquakes, and a wand that makes blocks. Just in case, you know, anyone needs any blocks. But Shadow of the Colossus has a different approach, and it's one that patiently sidesteps all this martial gimcrackery. The sword that Wander wields in his quest to kill the game's sixteen colossi is none of these things - it is not some stray digit in a numbers game, or deus ex machina uberbrand that will cleave his enemies in twain with a single blow. This is not a game where you scatter your foes like leaves, all without mussing your perfectly-feathered hair - rather, it's one that has you scraping along by the skin of your knuckles, clinging desperately to some shaggy forelimb to avoid being dashed to a tacky red smear. In this same way, Wander's weapons have a certain heft to them, a shape and a weight, impressing themselves as tangible objects of wood and metal. 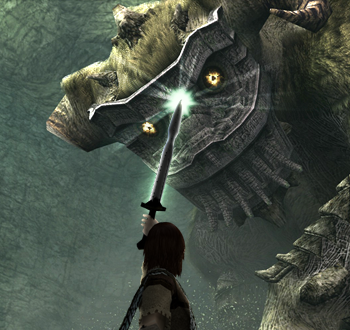 Through the relative weakness of the game's weapons versus the nigh-invulnerable stony hides of the its foes, Main says, Shadow of the Colossus adds more impact to its titanic battles, gently shaping with mood with its martial restraint. You can read more about it in "The Shadow and The Sword."